It has become a well-known fact that many industries have resorted to the use of UAV technology due to their ease of use, availability, cost reduction, and ease of accessibility. The roles that a drone can take on in our current and future lives are still a work-in-progress. From a security standpoint, the increasing number of drones per day is a cause of concern, especially when it comes to collision with aircrafts. So, what is the way forward when ISIS themselves have begun to utilise UAV technology? What happens when football stadiums equipped with the latest metal detectors and security cameras gets a €500 drone (that could be potentially equipped with explosives) flying in over spectators’ heads? In this blogpost we are going to look at some drone-related accidents that have occurred, why drones could pose a threat to aircrafts, and the way forward to avoid such collisions. How can Drones be a Threat? Where airports and security are concerned, drones can be considered threatening. It has become such an issue that the Federal Aviation Administration in the U.S. have claimed to receive 100 monthly reports on drone-related incidents, with 60% occurring within 8km of an airport and 11 times involving aircrafts having to be manoeuvred out of the way of a drone. In the UK, over the last 6 months of 2017, the record of drone-related incidents reached 35. Most of these occurred at an altitude of 12,000 ft, which is not that remarkable seeing that most consumer drones have a maximum altitude of 20,000 ft; however, battery limitations will impede this altitude from being attained. Whilst aircraft windscreens may be protected from bird encounters, the disintegration levels of birds and drones are incomparable. Whilst a bird is comprised of soft tissue and fluid, a drone is made of solid plastic and metal engines. The damage to an aircraft could vary depending on its weight and material. A multi-engine turbine powered aircraft can fly away with a non-functioning engine on take-off. This is because with one engine out, performance is hardly affected. Even though the aircraft may not be significantly destroyed, the economic impact could mean that it cannot be utilised whilst it is out for repairs. As for a lighter aircraft, the damage inflicted could be much more destructive as the material is lighter. Should it happen to be carrying people aboard, numerous fatalities and injuries could occur, and this could affect anyone in the vicinity on the ground, in case the aircraft crashes. The idea of terrorists using drones to launch an attack is no longer a figment of a sci-fi writer’s imagination: In January 2017, an attack was launched in Syria on 4 Russian military bases by 13 drones and we can say this has become a reality very much. Whilst the Russian Defence Ministry reported negative casualties or damage, the Pantsir-S1 shot down a number of these drones and even disabled the GPS and control systems. How Can We Defend Against Drones? There are currently over 155 companies working on developing anti-drone technologies. These could range from SIM cards in drones to systems enabling detection including radar, acoustics, radio frequency and thermal guns. Vodafone has developed a system with Sim cards, a 4G modem placed inside drones and a Radio Positioning System, made especially for UAVs. This enables tracking with a 50m accuracy by the operator of the drone as well as air ground traffic control. This system can also transmit geofencing that can force the drone to either land automatically or return to the operator. Another system is that developed by Ingegneria Dei Sistemi’s Black Knight radar. This is built on purpose and has optical and thermal sensors that can help to identify a drone in flight. It can discern a drone from 2km thanks to its optical and thermal sensors. 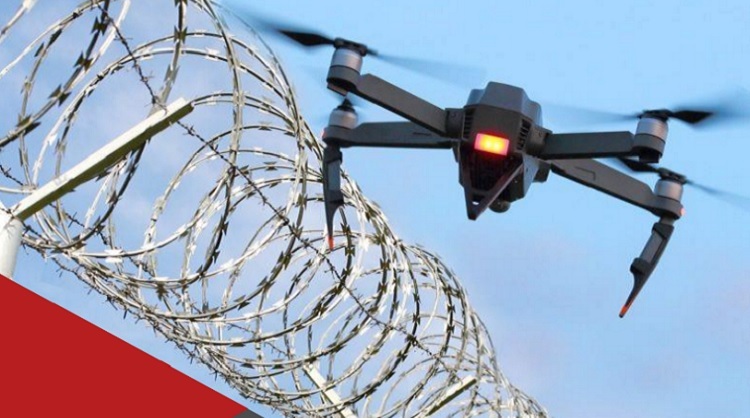 Drone guns are effective when it comes to jamming unsecure drone operations, yet while jamming equipment is illegal in some countries, in Malta it fortunately isn’t. The system can be completely fused in the security infrastructure, leading to a fence that disables the device. Mobile solutions that jam or take down the UAV are also on offer. The Hawk Overwatch saves data from past events and provides you with past data to illustrate what went wrong in the first place. At Hawk Aerospace you can meet designated engineers to fully train you and your company on specific operations.